By always being prepared, I was able to enjoy the city with a clear conscience. I avoided disposable cups and plastic bottles with a travel coffee mug and stainless steel water bottle. 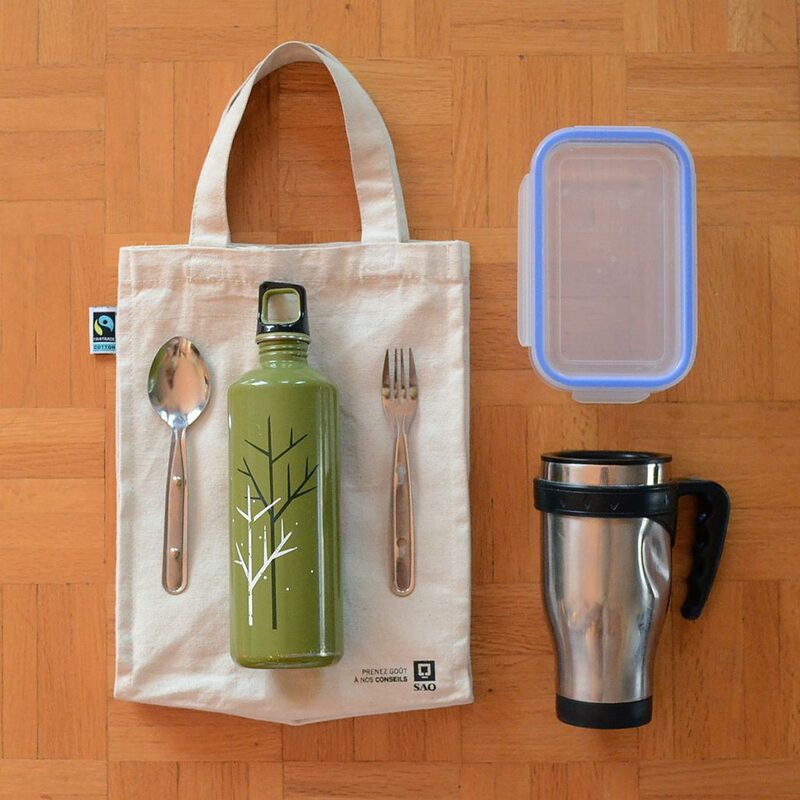 I avoided food waste with a reusable plastic container that I put restaurant leftovers in. I avoided plastic utensils by carring my own spoon and fork. 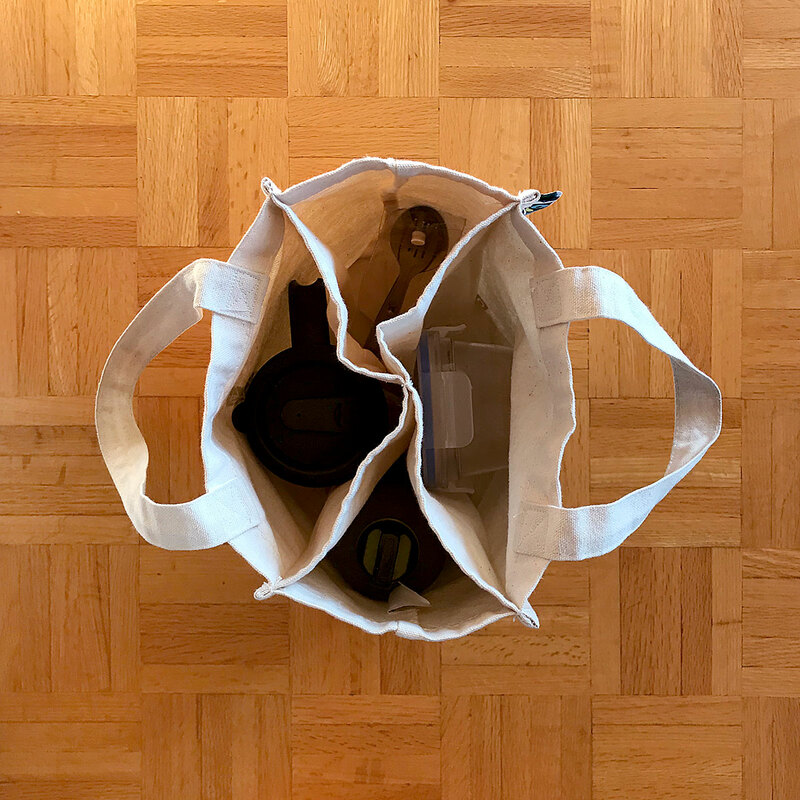 I avoided paper and plastic bags by putting purchases directly in my tote. Just found your site from a link in the Washington Post. It’s very useful and encouraging. Thank you. Thanks, Lynn! 🙂 Let me know if there’s anything specific you’d like to learn more about! I’ll try to address it in an upcoming post! I get so much “junk mail” often stuff sent to me from a charity I gave to…calendars, stickers, updates, solicitations from other related charities, and on and on. Don’t know how to tell them “thanks but no thanks”, I just want to give a donation and not create a stream of waste from it. How do you reduce the junk mail waste? In Canada, the Canada Post suggests putting a sign in/on your mailbox that says you don’t want to receive junk mail. This eliminates unaddressed junk mail, but but they still have to deliver mail that’s addressed to you. I also put a sticker on my front door to opt out of the circulars/advertisements that get dropped at my doorstep. If you get one of these marketing bags (sometimes combined with the local paper), contact the company and find out how you can stop receiving them. In the United States, you can register to receive less junk mail at dmachoice.org, optoutprescreen.com and catalogchoice.org. I’ve been doing many of these things since I was I’m my 20’s (50 years ago), but there is always room to improve. Years ago, I was able to shop at a dairy/health store which sold quart returnable glass bottles by the 6 pack. It was so convenient, but now the dairy is no longer in existence. What do you suggest for purchasing milk when glass bottles are unavailable? Also what about laundry detergent—all the containers these days are plastic; once upon a time we bought detergent in powder form in cardboard box containers. I tried making my own, but my clothes did not come clean. I get my milk and cream in consigned glass containers and love it. Sorry to hear the dairy is no longer in existence 🙁 I wonder if it would be worth talking to your local grocery stores and letting them know you’d like to buy milk in glass. Maybe the can source a new supplier? I’ve been trying to go zero waste for 6 months and have made lots or progress like reusable bags at grocery stores, not using straws and switching to bar soap, but there are still lots of things I struggle with. For example, I cook 90% of the time but on the odd night I want to do take out, I struggle with all the plastic and that comes home! Have you found a solution for that?? Thanks for the resource… keeps me motivated to reduce more. Where di you got this water bottle? I am looking for all metal water bottle, but for some reason, they either got lining inside or are insolated or have plastic caps:( yours is amazing! where can I get one like this? I got mine at a thrift store or garage sale—can’t remember which! It does have a plastic cap though.